The U.S. Air Force will deploy to Guam a fleet of its bomber aircraft along with 300 airmen from Ellsworth Air Force Base for the first time since April 2006, Air Force Times reported Thursday. Oriana Pawlyk writes the B-1 Lancer fleet will deploy to Andersen Air Force Base on Aug. 6 as part of the service branch’s effort to establish continuous bomber presence in the Pacific. The report noted the B-1B aircraft will replace the B-52 units from North Dakota’s Minot Air Force Base. 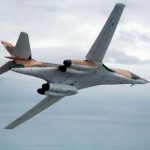 “The B-1 units bring a unique perspective and years of repeated combat and operational experience from the Central Command theater to the Pacific,” the Air Force said, according to the report. The B-1B Lancer long-range, multimission conventional bomber serves a conventional combat role and has completed more than 12,000 sorties since 2001.